The Rangeley area offers a ton to do, particularly in August. Alison and Aaron will be married on Mingo Springs Golf Course, a scenic 18-hole golf course that Aaron has played since he was just old enough to walk. There is world-class hiking as what many regard as the most difficult stretch of Appalachian Trail passes through the area, with several accessible access points. It was fishing that brought many to the area in the early part of the 20th century and the two large lakes and many streams and rivers continue to offer fantastic fishing. The same lakes offer what may be Alison’s favorite activity in Rangeley, le swimming (as the French might say). The lakes may be a bit cold but they are clean and clear. What if it rains? The area shockingly provides two interesting museums. We highly recommend you check out Orgonon, the site of the Wilhelm Reich Museum. 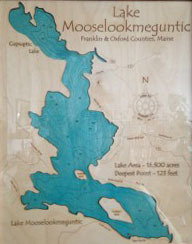 If psychoanalysis isn’t your thing, the Rangeley Lakes Region Logging Museum will appeal to the woodsman in you. Finally, a quick note to those of you driving up through Rumford (either because you took the front way or coming from Portland), there is URBAN PLANNING GEEKERY in Rumford, a nearby mill town where one of the earliest and finest examples of company built housing can be seen. Cass Gilbert designed the development which is now on the National Register of Historic Places. Rumford is definitely worth a stop. Alison and Aaron rarely miss a chance to at least cruise through. More info here. Here are a pile of links to activities. As the date approaches, we will post more information about activities that may be (loosely) organized for wedding guests.